* UNU studied 23 technologies independently tested in laboratory settings using groundwater from nine countries — Argentina, Bangladesh, Cambodia, China, Guatemala, India, Thailand, the United States, and Vietnam — and demonstrated efficiencies ranging from 50% to ~100%, with a majority reaching <90%. About half achieved the WHO standard of 10 µg/L. * 14 technologies tested in the field (at the household or community level, in Argentina, Bangladesh, Chile, China, India, and Nicaragua) achieved removal efficiency levels ranging from 60% to ~99%, with 10 removing more than 90%. Only five reached established the WHO standard. * Technologies that demonstrate high removal efficiencies when treating moderately arsenic-contaminated water may not be as efficient when treating highly contaminated water. Also, the lifetime of the removal agents is a significant factor in determining their efficiency. * For lab tested technologies, the cost of treating one cubic meter (m³) of water ranged from near-zero to ~US$93, except for one technology which cost US$299 per m³. For field tested technologies, the cost of treating 1m³ of water ranged from near-zero to ~US$70. 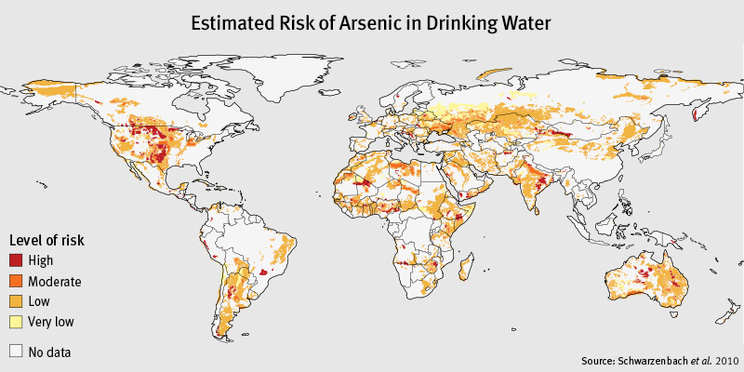 Co-authors Yina Shan and Praem Mehta, who worked at UNU-INWEH and are now at McMaster University, noted that exposure to arsenic can lead to severe health, social and economic consequences, including arsenicosis (e.g. muscular weakness, mild psychological effects), skin lesions and cancers (lung, liver, kidney, bladder, and skin). Estimated risks for arsenic contamination in drinking water based on hydrogeological conditions. Map modified after Reference 1.